For over 30 years, Roly’s Fudge has built a reputation for delicious, crumbly fudge prepared in full view of our customers. We’re all about the senses, enticing visitors with retail theatre, the smell of freshly made fudge and of course free samples! Originating from Devon in 1987, we have gradually been making our way north as our independently run pantries have gained a reputation extending beyond the South West. We only use high quality and carefully sourced ingredients and have zero food waste. 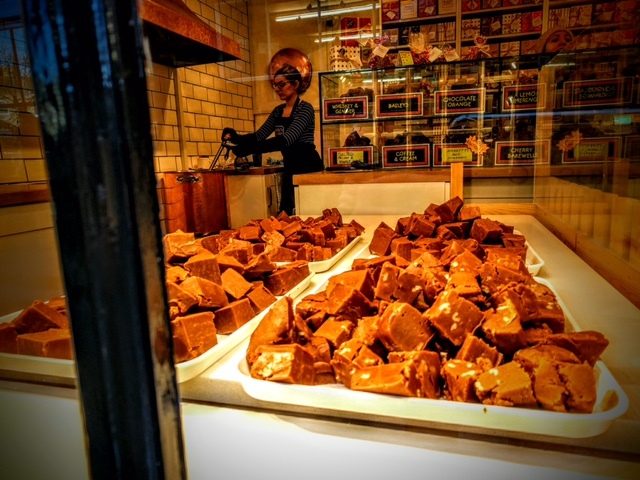 On top of this, all fudge sold in our Albert Dock pantry will be made on site and in full view of visitors using our traditional, proven and award winning recipe. Owner and retailer Greg Bresland, who owns two Roly’s Fudge Pantries in York and Bakewell, is particularly delighted to be setting up a Roly’s Fudge Pantry in Liverpool. “The Royal Albert Dock offers such a rich visitor experience, and I’ve been seeking a unit here for many years. The architecture, public space, cultural attractions and tenant mix all combine to create such a unique site. It really is something special, and I’m so pleased to not only be given the opportunity to add to the visitor experience, but to finally bring Roly’s Fudge to the people of Liverpool’. What’s more, Liverpool will be our 40th Roly’s Fudge Pantry – marking forty independently run boutique fudge pantries across the country! With a pre-Christmas opening, Greg and his team will be cooking up a fantastic selection of festive flavours alongside their best sellers. “If you’re more of a traditionalist, you can’t go wrong with our classic Vanilla Clotted Cream. If however you want to try something different, my personal favourite is our Salted Maple and Pecan”. So if you want something local, handmade and beautifully gift wrapped, various gift box combinations are available. Alternatively, if you want a little something to munch on as you meander around the docks, fudge is sold in quantities upwards of a chunk! Roly’s Fudge Pantry opens at Unit 17, The Colonnades, The Royal Albert Dock, on Saturday 8th December 2018.